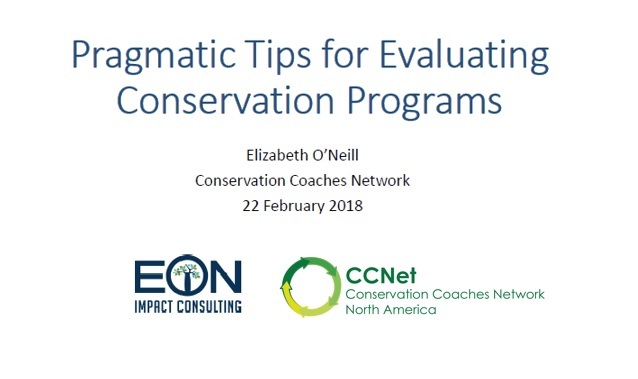 A webinar on pragmatic approaches to evaluating conservation projects and programs was jointly hosted by Elizabeth O’Neill from EON Impact Consulting, LLC, and CCNet North America on February 22 and 23, 2018. You can watch the Webex recording here, or download the slides here. Increasingly, conservation programs are subject to evaluation, driven either by an internal need to understand if desired results are being achieved and why or why not, or an external requirement by funders and/or organizational senior leadership. Many conservation programs do not yet have in place basic measurement and evaluation frameworks and associated data to guide and inform internally- or externally-driven evaluation. Elizabeth O’Neill will provide an overview presentation on the why, when, and how of evaluation that can help programs of all sizes to strengthen their evaluative culture and practice. This will include improving evidence-based and systematic internal reflection as well as being ready for and getting the most out of external independent evaluations. Elizabeth O’Neill, Managing Director at EON Impact Consulting, LLC, based in Colorado, USA. Elizabeth is a conservation planning and evaluation specialist with more than 25 years of experience working in environmental conservation. Since 2000, Elizabeth has worked almost exclusively in the international biodiversity conservation sector, supporting strategic planning and leading evaluations of multi-country, regional, and thematic programs. She has served as the lead on program assessment and evaluation for Conservation International, WWF International, and the Gordon & Betty Moore Foundation. Over the past 12 years, Elizabeth has led teams in designing and evaluating dozens of multi-country, multi-scale conservation programs across Central and South America, Africa, Eastern Europe, and mainland and Southeast Asia as well as global thematic programs in areas such as wildlife trade, climate policy, and market-based strategies. Through her various positions and projects, Elizabeth has worked closely with everyone from on-the-ground conservationists and their partners to senior leaders of conservation nonprofits to program officers and board members of major foundations. She specializes in employing pragmatic, mixed-methods approaches to planning and evaluation that cultivate participation, rigor, innovation, reflection, and ownership. Elizabeth holds a BSc in Natural Resources Management from Cornell University and an MSc in Sustainable Development and Conservation Biology from the University of Maryland. The Conservation Coaches Network is a voluntary network of over 600 dedicated coaches who work with projects to develop, implement, evaluate, adapt and share effective strategies to achieve conservation results that benefit people and nature. The network is represented by franchises, which are localized groups or network hubs, who link and strengthen coaches within each region. This webinar is co-hosted by CCNet North America. More information on CCNet North America can be found here.